Automation, AI and Robotics are undoubtedly forming the core of any strategy relating to enhancing customer experience, with new technologies enabling us to create stronger relationships with customers through fast, accurate and consistent responses to their queries. 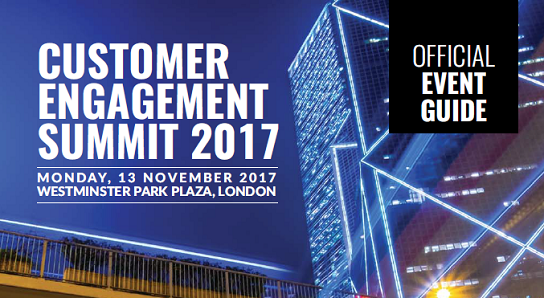 Join us at this unique, interactive and intimate event that will allow you to network with 100+ peers working in similar roles to yourself, as well as giving you the opportunity to hear from global experts, leading edge technology companies and also from organisations implementing automation and AI strategies in the field of customer engagement. 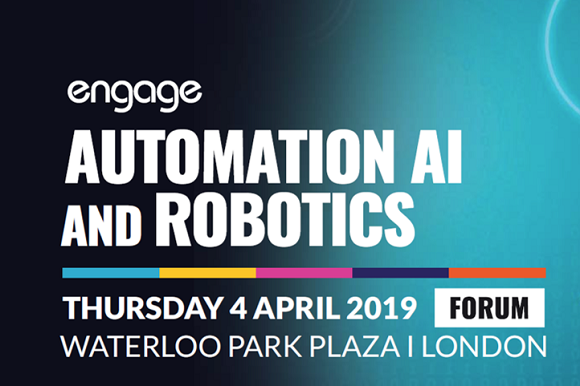 Our speakers will be discussing how you can deliver the business value of AI, how you can bring people and technology together to drive digital transformation, how you can use AI in your CRM in order to create and protect customer value, the smart actions of leading companies, critical conversations that you need to have on the road to adoption, and ultimately how to implement intelligence to transform customer engagement. With the contact centre space providing a significant, growing opportunity for customer experience, it is these touch points that provide a powerful tool to transform the success of a brand in today’s digital world where customers expect responses 24x7x365. For this reason, we’ve gathered experts in the field from an array of world-class organisations who have already successfully transformed engagement, and they’re excited to help you do the same. 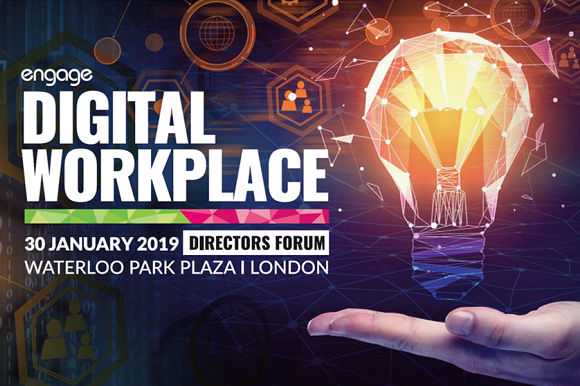 Our Digital Workplace Directors Forum will examine in detail how the needs of our people are changing and how and where we can equip them to cater for this workplace revolution. Failure to do this is not an option. 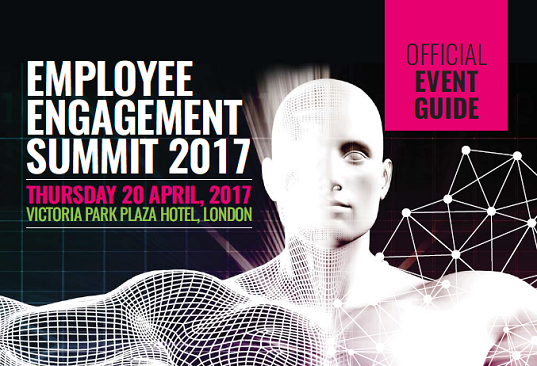 Delegates at the Forum will witness case study content from organisations who are already implementing Digital Workplace strategies to improve employee and customer engagement. 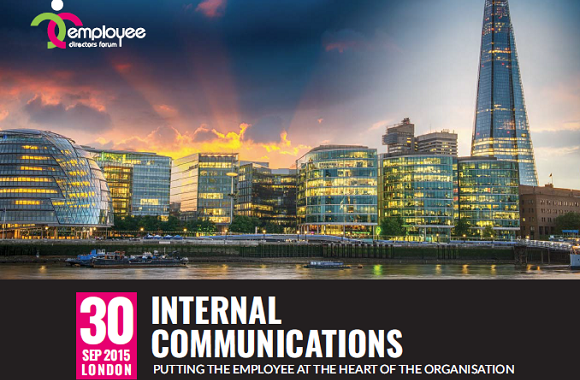 Contact centres are ideally placed to become the beating heart of an organisation. With the contact centre space providing a significant, growing opportunity for customer experience, it is these touchpoints that provide a powerful tool to transform the success of a brand in today’s digital world where customers expect responses 24/7/365. For this reason, we gathered experts in the field from an array of world-class organisations who have already successfully transformed engagement, to help you do the same. 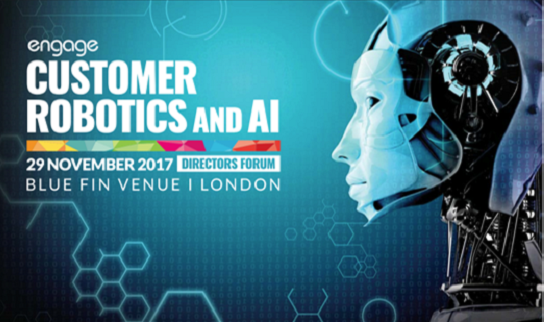 The Robotics and AI in Customer Engagement Directors Forum drilled down into some exciting new areas and examined how organisations are grappling with the challenges and opportunities that are presented in relationships with their customers. Delegates at the Forum heard from global experts, leading edge technology companies and also from organisations implementing robotics and AI strategies in the field of customer engagement. This CPD accredited conference brought into sharp focus the challenges and opportunities facing our rapidly changing workforce in a fast evolving workplace environment. Case studies included: Twitter, Missguided, Public Health England, Land Registry, University of London and more! 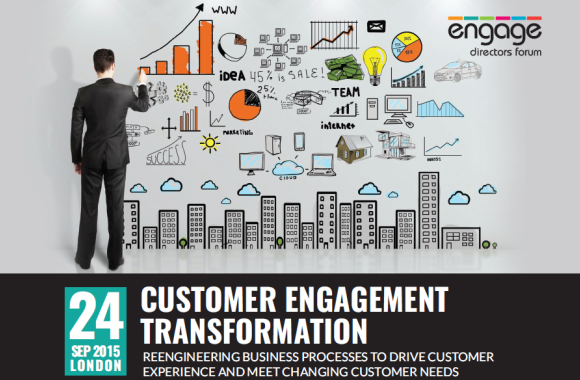 This CPD accredited conference follows on from our two hugely successful Customer Engagement Transformation Directors Forums in 2015 and 2016 and is testament to the imperative for organisations to constantly evolve their customer engagement strategies. This CPD accredited conference has gained a reputation for delivering leading-edge world class case-study led content in a business-like yet informal atmosphere which is conducive to delegate, speaker and sponsor networking. It’s a place both to learn and to do business. Case studies included: M&S, BT, Dixons Carphone, Sky, Barclays, SureFlap, Virgin Atlantic and more.. 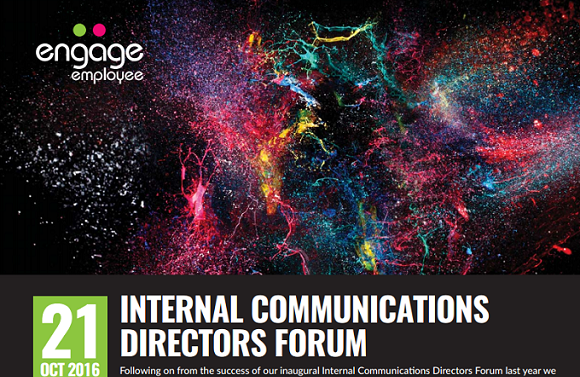 Following on from the success of our inaugural Internal Communications Directors Forum last year we take an in depth look at the fast changing world of internal communications and how it is increasingly taking on the critical employee engagement role that has too often been neglected by those in HR. Case studies included: Oxfam, ITV, The Co-Operative, Visa Europe, BT and more..
Our customers, their expectations, their journey, and the ways in which they interact with organisations have changed almost beyond recognition over the past few years. 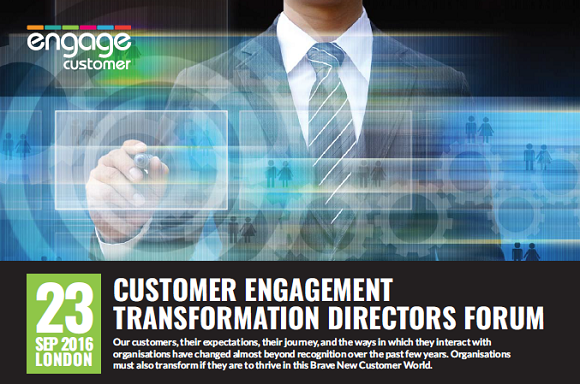 Organisations must also transform if they are to thrive in this Brave New Customer World. Case studies included: Google, RS Components, Great Western Railway, Lloyds Banking Group, Transport for London, Sony and more.. 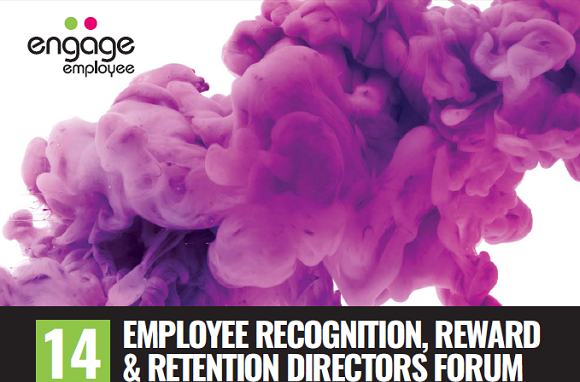 When it comes to our people then Reward, Recognition and Retention are most definitely the three R’s of engagement. Case studies included: Starbucks, Barclays, Three, Anchor Trust, SNC-Lavalin Rail & Transit, The Association for Business Psychology, Engaging Service & Real Results. This Forum looked at how customer behaviour and expectations are changing at a dramatic and accelerating pace. It is vital for organisations to keep up with their customers’ journey or they will lose them, and this Forum brought those at the forefront of the industry along to aid our delegates in developing innovative strategies that keep abreast and indeed ahead of customer demands. This year’s Forum focused on new developments such as the ever closer links being forged between the Voice of the Customer and the Voice of the Employee. 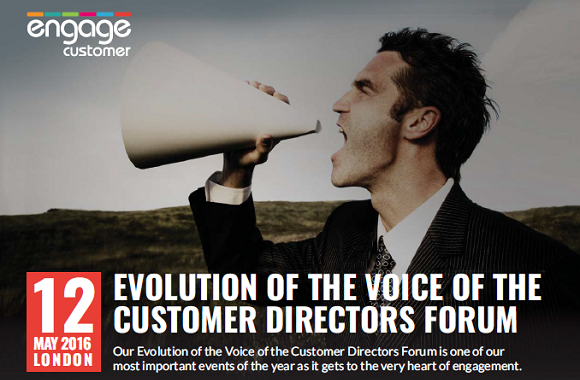 Strategies that are evolving around VOC and VOE are some of the most dynamic in the customer and employee engagement space and this Forum featured a roster of case studies to reflect this changing landscape. Delegates heard how successful VOC programmes are evolving and delivering valuable insights and driving employee and customer engagement, enabling them to help implement their own strategies for long term success. Speakers included: Metro Bank, Three, Nationwide, IHS, SACO Serviced Apartments and more. 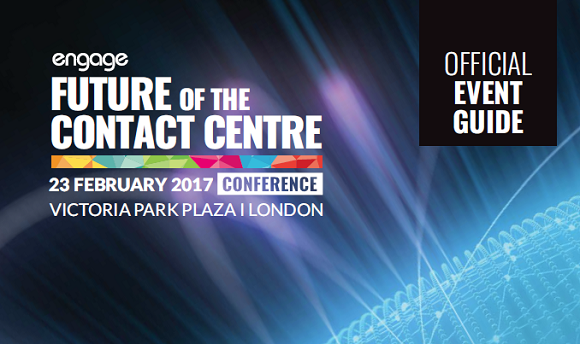 The contact centre is perfectly placed to become the beating heart of an organisation’s customer engagement strategy, to become the Customer Engagement Hub of the future. The contact centre is where the brand lives or dies in the eyes of the customer. It is the place where real, in-depth customer insight sits. It is the contact centre that can deliver on the entire customer experience. But this will only happen if organisations understand that customers are now in control of the channels they choose to interact with organisations. 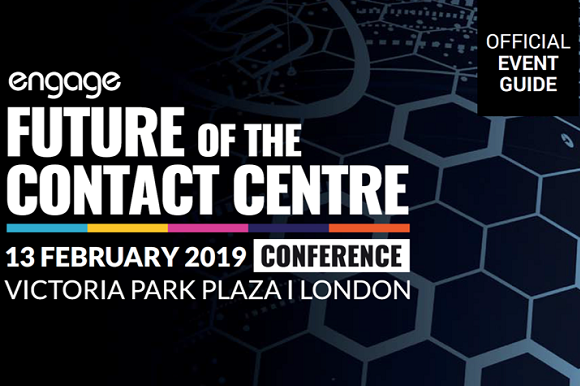 Our Future of the Contact Centre Leaders Forum looked at what the contact centre of the future should look like as our customers continue to change their behaviour in this digital age. 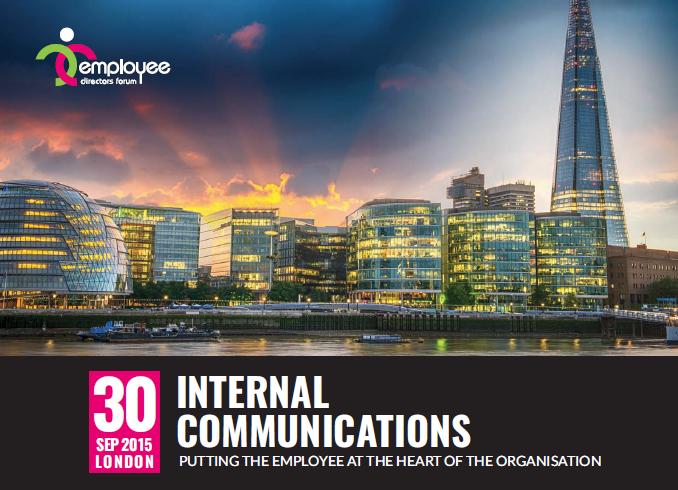 Speakers included: Barclays, BT, Unilever, Chaucer Direct, The Co-Operative Bank and more. Over the past five years customers and the way they interact with organisations have changed almost beyond recognition. Organisations must also transform if they are to thrive in this Brave New Customer World. The old command and control way of thinking has to be consigned to the dustbin of history. Organisations need to ditch their siloed approach and re-organise themselves so that they mirror and enhance the omnichannel customer journey. There is a growing need for a Customer Hub where people with complementary skills from all areas of the organisation, front, middle and back office, come together with the customer at the heart of the conversation. This means taking a fresh approach to continuous improvement and service innovation: re-energised through new partnerships with customers and employees. Case Studies included: Atom Bank, Nationwide, BP Group, Equiniti, BT. Expert Speakers include: Henley Business Centre, Forrester, Brainfood Consulting. The Telco and Utility sectors are both facing a number of challenges when it comes to engaging customers across channels, with both sectors consistently scoring low across a raft of respected customer satisfaction surveys. Both face challenges in the perception of where the customer lies within their organisations and much work needs to be done – particularly in the utilities sector where accusations that the Big Six utilities effectively run a cartel are ongoing – and where Government is stepping in to control pricing. The correlation between highly engaged employees and customers who are similarly engaged is irrefutable. Study after study has proven there is a clear path from engaged employees to engaged customers to improved performance and profitability – and yet two in three employees remain disengaged. This Directors Forum will lift the lid on the employee and customer engagement strategies that are making some organisations winners and where the links between employee and customer engagement are being leveraged to provide benefits to all stakeholders to gain competitive advantage. The Financial Services sector is under continuing pressure to get its customer offering back on track. 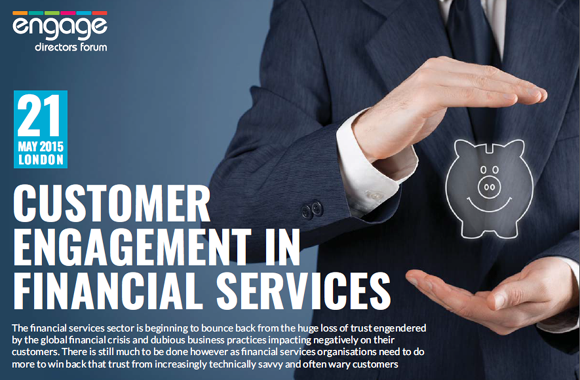 That pressure comes from consumers, who have lost trust in the sector for a whole host of reasons,and also from regulatory bodies who are continuing to introduce a roster of changes that impact on the relationship between financial services providers and those who use their products and services. The retail sector is in a state of major flux and there will continue to be winners and losers as consumer behaviour controls the sector. While the squeeze on consumer spending is having an often detrimental impact on the High Street, online retail sales are continuing to enjoy exponential growth as customers use their smartphones and tablets for shopping and savvy retailers market to these geographically sensitive devices. 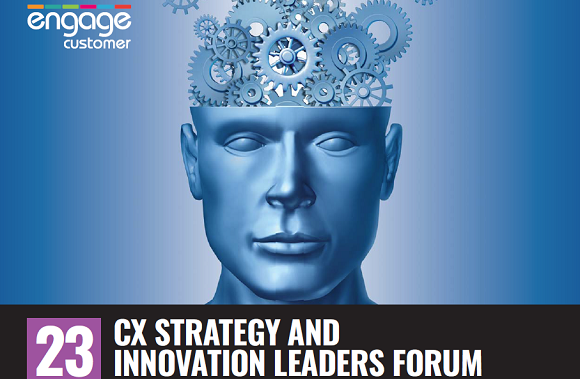 This Forum will examine the key challenges and issues facing customer experience leaders in the evolution of their Voice of The Customer strategies as part of an overarching employee and customer engagement approach. The relationship between employee and customer engagement performance and profitability becoming one of the hottest of all strategic business issues. The need for organisations to engage and properly direct their people in tough economic conditions is one of the biggest boardroom issues of our times and is being taken seriously at the very highest levels of business and government. A recent report from KPMG suggests that the public sector is showing the private sector the way forward when it comes to use of social media both for its employees and its customers. Indeed the public sector is proving to be increasingly innovative and imaginative in the ways in which it engages with its stakeholders in the light of tough economic conditions when budgets are being continually scrutinised and cost savings are high on the agenda. engaging its internal and external stakeholders, and focus on some of the ground breaking best practice. This Directors Forum will highlight the key issues and challenges facing the much maligned financial services sector and its relationships with customers against a backdrop of continued difficult economic conditions. It will offer practical solutions to these challenges for a troubled sector. It will drill down to the core of the problems and help delegates find the best way forward. The rise and rise of mobile customer engagement has been instrumental in changing the whole face of customer relationships. Today’s customer has more power, a greater say in how an organisation designs its products and services and is more likely to take the opportunity to have their say. This Directors Forum will examine the issues, challenges and opportunities around mobile customer engagement and how savvy organisations are working with this burgeoning channel to market to gain competitive advantage. A major global research report shows that four out of five B2B organisations give overall responsibility for customer engagement initiatives to a vice president or director-level executive – and half of these organisations have increased investment in customer engagement and experience over the past five years. This Directors Forum will examine the growing recognition of the business critical nature of B2B Customer Engagement and the key trends and challenges impacting this dynamic sector where the engagement stakes are higher than ever before and where insight and understanding within close-knit relationships are key to success. The retail sector is in a state of flux. While the squeeze on consumer spending is having a largely detrimental impact on the High Street, online retail sales are continuing to enjoy strong growth. And while a number of well known retail brands have disappeared over the past couple of years, others are not only surviving but thriving as they adopt winning customer engagement strategies. This Directors Forum will take a look at the key issues, challenges and trends in this fast moving and volatile industry sector. It will spotlight the developing dynamic in relationships between retailers and their customers in an increasingly multichannel environment, and how fundamental changes in consumer behaviour are impacting on retailers as they strive for sustainable success. back on feedback, closing the feedback loop, are business critical issues. the development of engagement strategies. This Directors Forum will lift the lid on the employee engagement strategies that are making some organisations winners in the battle for customer loyalty, and where the links between employee and customer engagement are being leveraged to provide benefits to all stakeholders and to gain competitive advantage.